The Workers` Wall commemorates the contribution of workers at the Midland Railway Workshops in its 90 years of operation. 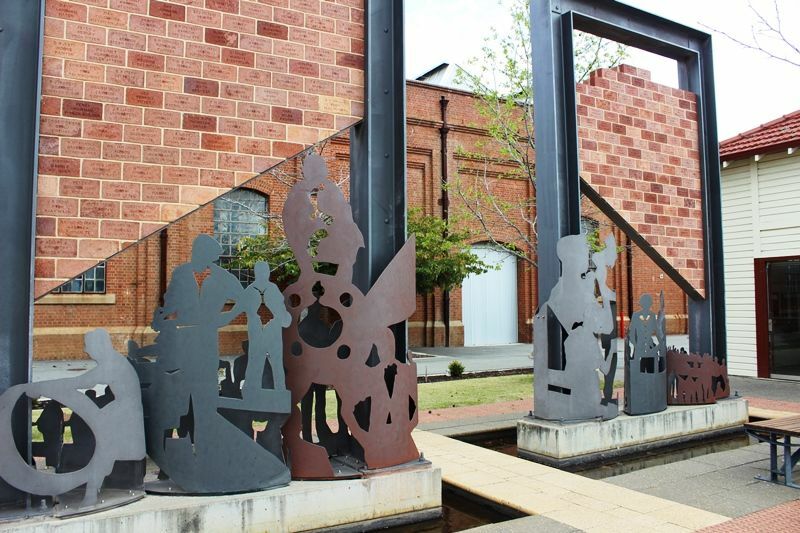 The memorial is an art installation that consists of a number of brick walls framed in steel with different sculptures of people and equipment made of metal. On each of the bricks there are inscriptions of a workers name and their job. There is an olive grove and a garden surrounding the memorial with benches. People visiting the memorial can purchase bricks to commemorate someone who worked on the railways. The Midland Railway Workshops were the main workshops for the Western Australian Government Railways (WAGR) for over 80 years. In April 1993, and then Richard Court Liberal State Government announced that the Workshops would be eventually closed. Despite a number of protests and rallies to save the Workshops, the call to save the Workshops was completely ignored by the Government. On Friday 4 March 1994, the remaining workers assembled at the traditional Workshops meeting area, the flagpole. Longtime employee and timekeeper, Kevin Mountain was given the task of lowering the Australian flag for the last time ending not only his career but 90 years of Western Australian railway history. Generations of workers at the workshops had considerable numbers of European migrants who arrived in Australia with limited English language, and there were significant groups of Italian migrants in the workforce. The workforce of the workshops had a rich history and, since closing, there have been projects to record oral history and collect information about the place and people involved. This wall of names is an initiative of the Midland Redevelopment Authority that seeks to commemorate and celebrate the contribution of the many generations of workers at the Midland Railway Workshops throughout its 90-year history of operation from 1904 through to 1994. The Workers` Wall will grow over the years as a permanent tribute to the thousands of Western Australians who wove the rich social history of this significant heritage site. Project architect Mr Philip McAllister worked in collaboration with artist Mr Mark Grey-Smith to design and oversee the construction of this unique art work.